December 10, 2015 by Mike Bracken. Average Reading Time: less than a minute. 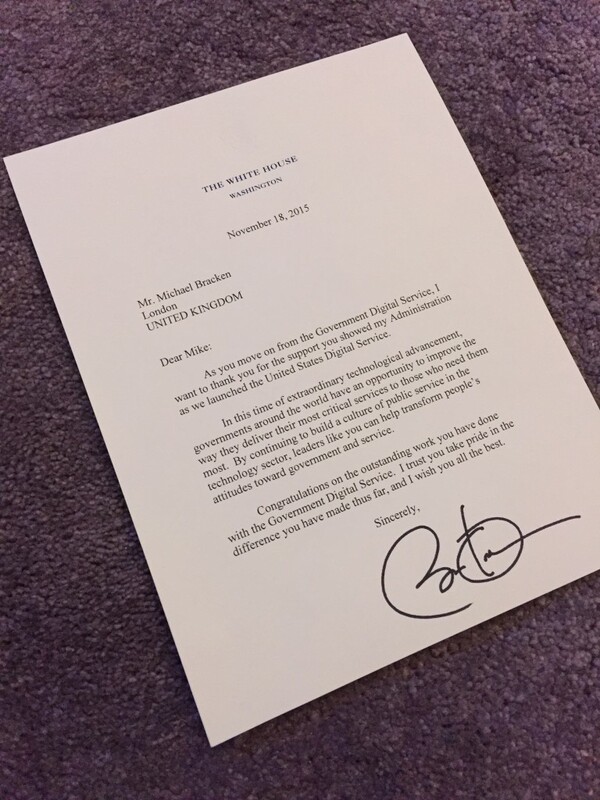 As birthday envelopes go, today’s letter from the White House was something special. Since I left Government a lot has been happening internationally. The US Digital Service is going from strength to strength. Some examples are worth noting. The amazing Dan Hon and the Code for America team have unveiled a huge change in technology procurement and Rob Klopp and the USDS team are bringing long awaited change to the Social Security Administration. These are major changes to the machinery of Government in America, the types of bold, politically backed transformation which all Governments with legacy systems and services will need to undertake. The establishment of the US Digital Service is critical in supporting and delivering these changes, and so it was very thoughtful move to acknowledge the pioneering role of the British Government Digital Service in setting a precedent. A very classy addition to the birthday bounty. Thank you for this recognition Mr President, but it really belongs to all who have supported digital Government in the UK.